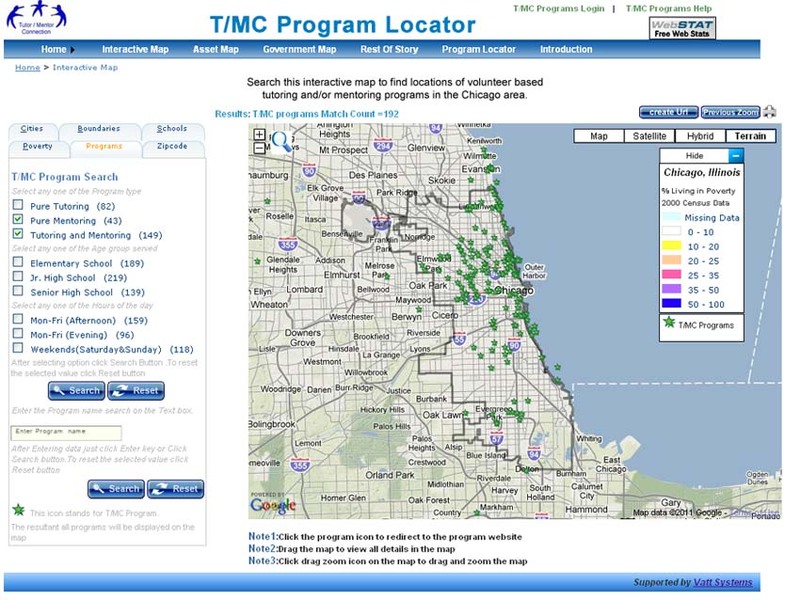 Notice: the Chicago Tutor/Mentor Program Locator, created in 2008-9, is not connecting to Google maps, as of 8-3-2018. Read this article to learn more. Volunteer (or donor) help is needed to fix this. All of the articles in this section, and on our blogs, show ways to use a program locator type mapping platform to support the growth of needed youth and family services in high poverty areas. Even though the Chicago Program Locator is not working, the examples are still models that others could apply in other places. No General would go to war without a map. Strategies leaders can use. The Tutor/Mentor Connection (T/MC) has created a variety of short PDF essays to illustrate how maps can be used by leaders to mobilize and distribute volunteers, dollars, technology and other resources to fight America’s war on poverty, poorly performing schools, crime and violence. 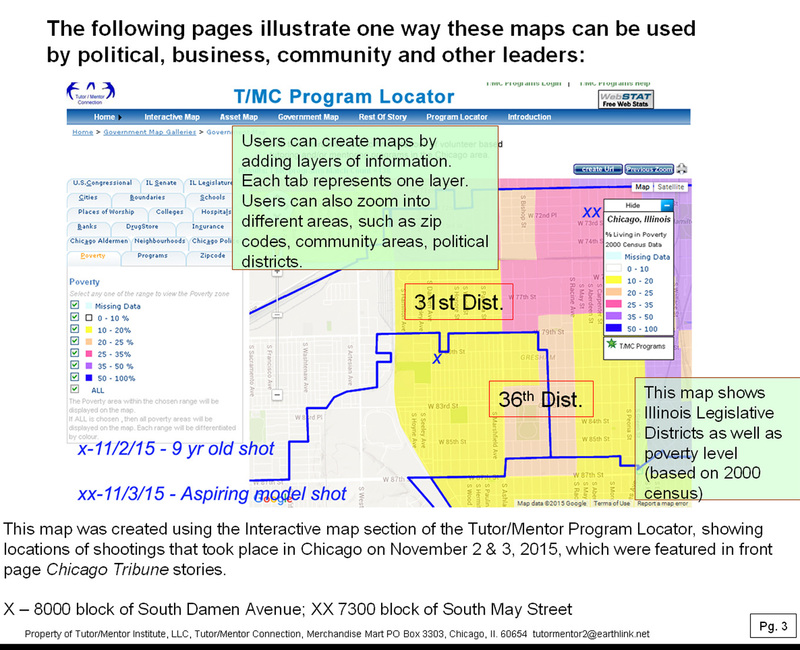 See column in 10-21-2015 Chicago Tribune about using maps in violence prevention strategy. See map at the left in this blog article. Using maps this way has been a vision of Dan Bassill's since 1993. See article from 1994 ChicagoSunTimes. 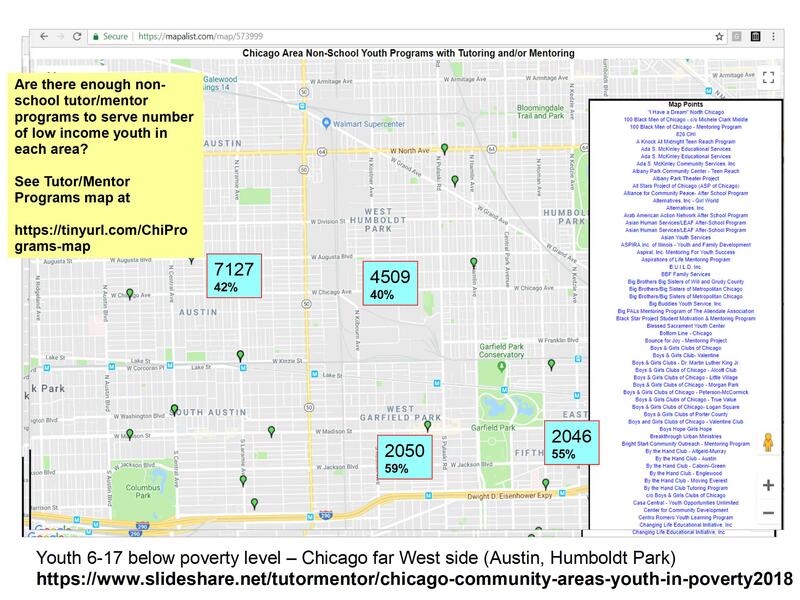 The Chicago Tutor/Mentor Program Locator was created in 2004 to help leaders, volunteers, donors, parents and social workers find places in different zip codes that offer volunteer-based tutoring and/or mentoring in the non-school hours. NOT ALL FEATURES ARE CURRENTLY WORKING. TECHNOLOGY VOLUNTEERS ARE NEEDED TO HELP FIX THE PROBLEM. Email tutormentor 2 at earthlink dot net if you can help. Using Maps to tell "The Rest of the Story"
A key part of the Tutor/Mentor Connection (T/MC) strategy is to "increase the frequency of media stories and advertising that draw attention to tutoring/mentoring and draw volunteers and donations to tutor/mentor programs in different parts of the Chicago region. Visit the Tutor/Mentor Map Gallery to see this strategy in action.